All of T3 BioScience’s Research & Discovery efforts and product focus is powered by the wish to save lives. As quoted by the UK government report of 18 months’ review of antimicrobial resistance, “Superbugs are expected to kill as many as 10 million people annually by 2050, without major intervention…”, it is clear that science has to invest today for the protection of lives of our children and grandchildren. Focus cannot only be on creating new antibiotics, but also addressing and breaking the cycle of human antibiotic resistance. T3 BioScience specific R&D and product focus is addressing some of these challenges creating opportunities for both helping society through our eventual products as well as generating returns for T3's shareholders, who have put their trust into our companies mission and activities. We have implemented a consistent strategy that helps the team keeping focus on R&D and business initiatives relevant to our product and commercial interests. Our strategy is guided by our mission and vision and combined with our values; they support the creation of long-term values and assets for T3 BioScience, our investors and society. Our strategy is expected to financially protect shareholders' interests, because commercialization of agricultural treatments with (i) a shorter time-to-market and (ii) less costs than commercialization of a novel medical drug, will help delivering earlier Return on Investment to our investors and provide additional financing for the medical R&D. Innovation is the core value to product development that differentiates itself from other R&D. We strive for entrepreneurial spirit that can execute and deliver on an ambitious aspiration of what T3 BioScience wants to achieve. All of us in T3 and future members shall be of high integrity, honesty with a performance-focused mind whilst retaining high quality standards. 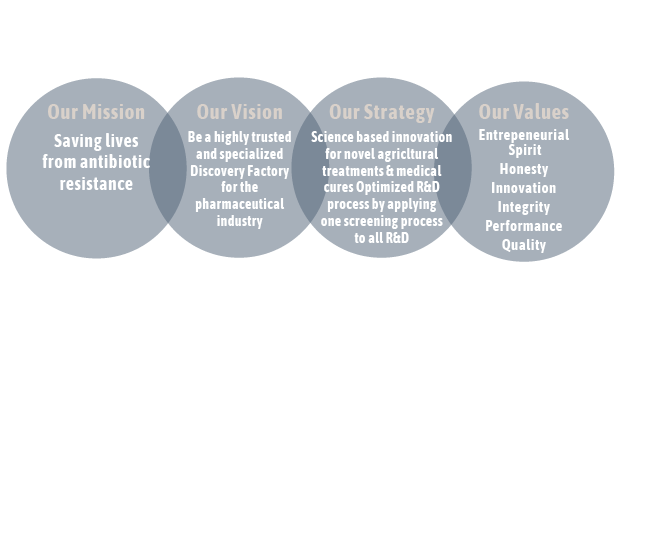 It is our vision, considering T3's size and - in the face of high costs for agricultural treatment and medical drug development - T3's limited financial resources, that we focus on creating and promoting a highly trusted and specialized Discovery Factory that will lead us to a revenue generating business over the next five years, without blocking the company's opportunity to materialize inflection points that will appear during the medical R&D process. T3's management understands "inflection points" as being triggered the discovery of a very powerful and highly efficient novel antibiotic bacteria, which T3 would want to bring itself to clinical phase I testing, followed by a second inflection point of clinical phase II testing, without selling the Lead Compound after a successful preclinical testing. It is understood that when reaching such inflection point, T3 BioScience would require seeking new investments in order to fund the high cost of clinical (human) trials.